This stoneware vase is one of the largest pieces the Danish artist made in the “budded” style, a recurring motif in Salto’s oeuvre that references organic forms like seedpods and budding flowers or fruit. The piece features earthen colours achieved with a Solfatara glaze, a medium developed in the mid-1930s that relies on a metallic oxide to produce variations of yellow and black when fired. 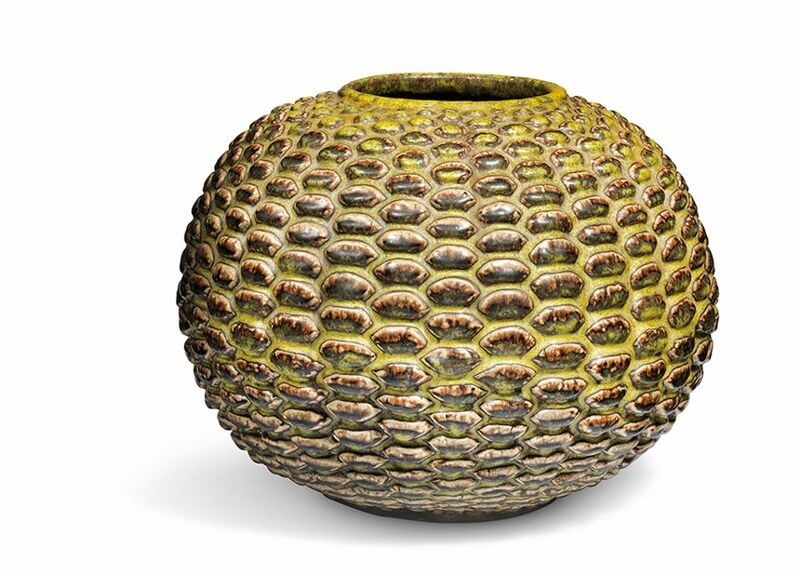 This glaze is the most desired of the artist’s ceramics; another vase, similar in style but made with a Sung glaze, which is considered “less attractive”, says Peter Kjelgaard Jensen, the auction house’s head of design and 20th-century decorative art, made €67,600 (est €50,000-€70,000) at Piasa Paris this year. Three blue waves on the bottom of the vase indicate the piece was manufactured by the Royal Copenhagen porcelain manufacturer. The edition size of this design is unclear, but “pieces made prior to 1961, the year that Salto died, are always preferred, under the notion that he inspected the pieces before they were sold”, says Jensen. Salto, who classified his ceramics in categories of “budding”, “sprouting” and “fluted”, looked to nature for inspiration during a time when ceramics were dominated with Chinoiserie; his earthy style has found acclaim alongside that of later studio potters like Lucy Rie. A more intricate budded vase achieved £373,250, Salto’s record price, at Phillips London in 2012. The auction house’s third sale of Aboriginal art features a vibrant canvas in synthetic polymer paint that Emily Kame Kngwarreye made in the summer, a period brimming with ritual activity for Australian Aboriginals, in 1991. The rhythmic composition, the third and largest in a series of four paintings, may allude to the landscape of the outback as well as the painted skin markings of ritual participants, which traditionally feature rings encircled with dots. Another work from this series, called Kame, is held by the National Gallery of Victoria in Melbourne, and others are in private collections. Kngwarreye, among the most famous Aboriginal artists, was born in a remote area of the Australian desert known as Utopia and had a short but prolific career. In the late 1980s, when she was nearly 80 years old, the artist transitioned from creating batik patterns on fabric to painting on canvas, and produced many works for the Central Australian Aboriginal Media Association of Alice Springs, which worked to disseminate indigenous culture. Experts estimate that Kngwarreye created more than 3,000 paintings in the course of eight years before her death in 1996. Nearly two decades later, the Dutch art dealer and collector Hank Ebes launched the Emily Museum in Cheltenham, Victoria, the first museum dedicated to a single Australian Aboriginal artist, which houses more than 200 works. Last year, Cooee Art Marketplace set the artist's record at AUD$2.1m with the painting Earth’s Creation (1994). Giacomo Manzù, a pseudonym of the self-taught Italian sculptor Giacomo Manzoni, designed this table for his home in San Vigilio. The unique piece is the first sculpture from Manzù’s home to surface at auction and has been consigned by the artist’s daughter-in-law after spending the last two decades on display at the Galleria d'Arte Moderna e Contemporanea of Bergamo, where Manzù was born. 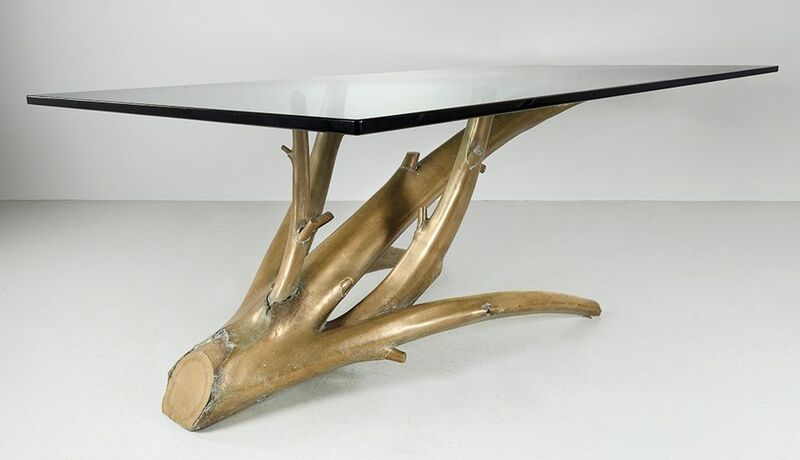 The table, manufactured by the MAF foundry of Milan, is made of Bohemian crystal glass and supported by a branch base cast in an alloy of bronze, silver and gold, which creates the glimmering golden surface. Branches and botanical subjects were motifs Manzù used often, as seen in works like the Porta della Morte (1952-1964) he made for Saint Peter’s Basilica in Rome. The artist used the same custom alloy to create his best-known sculptures, including some in his Cardinal series, which the artist began in the late 1930s and continued throughout his career. A set of three bronze Cardinal works set the artist’s auction record in 2001, making £432,500 at Sotheby’s London, however, there are “few examples of furniture to compare this piece to, and no auction examples”, says the auction house’s design expert, Gerti Draxler. She adds, “we believe it will achieve a good price since it’s so unique and totally fresh to the market”.